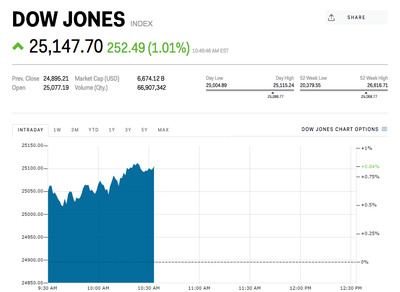 Stocks are surging Friday after President Donald Trump dialed down his tariffs, progress in North Korea, and a strong jobs report. All of the major averages are up at least 1%. Steel stocks are a notable laggard. Follow the Dow Jones industrial average in real time. US equity markets are surging Friday as traders digest a plethora of macro news. All three of the major benchmarks are posting gains of at least 1% following a dialling down of President Donald Trump’s tariffs, progress in North Korea, and a strong jobs report. The good news started to flow Thursday afternoon following Trump’s announcement that while his tariffs on aluminium and steel would start in 15 days, Canada and Mexico would be exempt and other trading partners would be looked at on a case by case basis if they submitted a request. Then, Thursday evening, Trump, through South Korean National Security Office head Chung Eui-yong, said he would meet with North Korean leader Kim Jong Un by May to discuss “permanent denuclearization” by the rogue state. The good news kept coming Friday morning in the form of a strong jobs report when data released by the Commerce Department showed the US economy added 313,000 nonfarm jobs in February, easily surpassing the 205,000 estimate that was anticipated. Friday’s gains are led by the energy sector, which is trading up 1.6%. Financials, information technology, and industrials all sports gains of at least 1%. Caterpillar and Intel are the top performers in the Dow Jones industrial average, both trading up more than 2%. Meanwhile, Steel stocks are a notable laggard as traders have opted to sell the space in response to Trump’s softening of his tariffs. AK Steel is down 2.66% and US Steel is off 2.89%. Optimism surrounding the jobs report has weighed on US Treasurys, running the 10-year yield up 5 basis points to 2.91%, its highest in about two weeks.